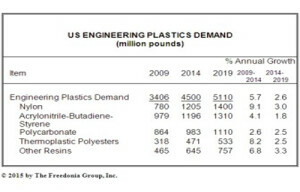 The demand for engineering plastics in the US is expected to rise 2.6% per year to 5.1 billion pounds in 2019, said the latest Freedonia report. The largest markets for engineering plastics will continue to be the automotive and electrical and electronics . The auto sector will increasingly rely on engineering plastics to reduce vehicle weight in order to improve fuel efficiency. However, the construction and the medical and consumer markets will provide the fastest growth. Polyamide (PA) also known as nylon, acrylonitrile butadiene styrene (ABS), and polycarbonate (PC) will continue to be the three largest engineering plastics by volume, accounting for three-quarters of total demand in 2019, according to the report. 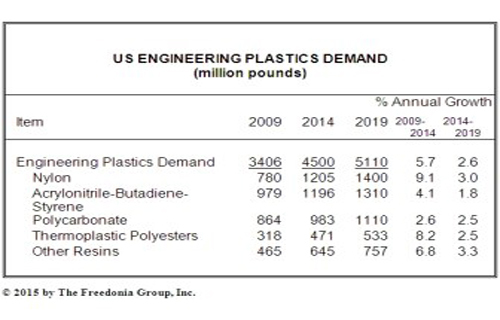 Nylon will post the most rapid increases of the three and will remain the largest engineering plastic, according to Freedonia Analyst Joseph Kocian, “This growth will be mainly driven by nylon supplanting metals in underhood motor vehicle applications. Smaller-volume engineering plastics such as polyphenylene sulfide (PPS), sulfone polymers, fluoropolymers, and polyketones will exhibit the fastest growth, driven by specialized use in mature markets as well as utilization in new products such as advanced batteries, photovoltaic modules, and medical implants. These resins will see greater use in and automotive industries, where they are typically used to fill specific high-temperature needs and their greater cost can be economically justified.